The YC Buddies are big fans of Artistang Artlets, the official theater guild of the UST Faculty of Arts and Letters. We make it a point to always watch their plays, even when we’re not required by our professors. 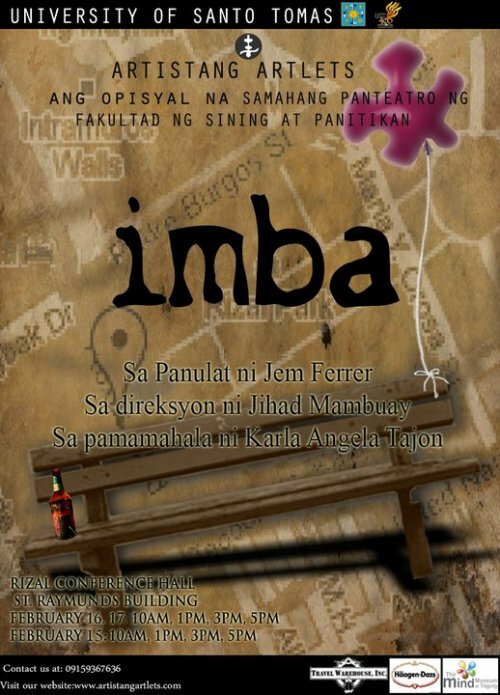 Imba, written by Jem Ferrer, directed by Jihad Mambuay, and (ohnoes, how do you translate “sa pamamahala ni”??) Karla Angela Tajon, was shown at the Rizal Conference Hall in our building. It was sort of a Valentine’s play, since the theme was love (of course). To be completely honest, even though the past AA plays I watched have been great, I wasn’t expecting much from this other than the usual clichés you see in movies. I mean, seriously. It was Valentine’s Day! I thought AA would show a frilly, fluffy love story about unrequited love and all that overused Hollywood rom-com bullcrap. Thank god I was wrong. A guy who caught his girlfriend cheating on him. He gets drunk, stumbles in the park, and at the end, it’s implied that he ended up with the balloon vendor. A guy and a girl were coworkers who say that they didn’t want a relationship but it’s clear that they’ll get together. Ridiculously cliché but it was a good scene nonetheless. Two guys named Alex and Chuck, who were in a relationship seven years ago, meet again and discuss their past. It’s revealed that Chuck now has a daughter, who he named Alex. A couple of jejemon street sweepers (who call each other “bhe,” lolololol) in a typical lover’s spat. It’s actually quite sweet and gave me the kiligz~ The girl eventually revealed that she is pregnant. Watching this made me cry. The lines were tagos-sa-puso and “tuhmuh!”-inducing from anyone who has ever been in love. “under the supervision of…” is “pamamahala” =) i think, at least haha.